Our first cover version, of the Skip Spence song Land Of The Sun, will be released on the double LP compilation Keep Off The Grass on Fruits de Mer Records. Details including track list and samples are now available on the FdM website. Thanks to everyone who came to see us at the Ducie Bridge last night, thanks to Alex from Manchester Bands Union for putting us on, and extra special thanks to Ste from Jesus Knievel for stepping in when two of the other acts pulled out on the night. More gigs coming up – check the Gigs page for details. This Friday (28th October) at the Ducie Bridge, Manchester, with India Mill, White Swallow and Stalagmites – on stage approx 9:30 pm, free entry. Friday 25th of November, a show promoted by the incomparable Fat Out Till You Pass Out headlined by Remember Remember and also featuring local art-throbs Maria And The Gay. Venue yet to be announced. Thursday 8th of December – Flat Field at Platt Chapel, with Gabriel Minnikin joining us for a few numbers. Opening will be Don’t Sleep Dream from Sheffield, and headlining will be Gabriel with his own five-piece band. Come on down to Platt Chapel (on Wilmslow Road between Rusholme and Fallowfield) this Thursday for the first of a monthly series of leftfield live music nights hosted by our bass player Nick. 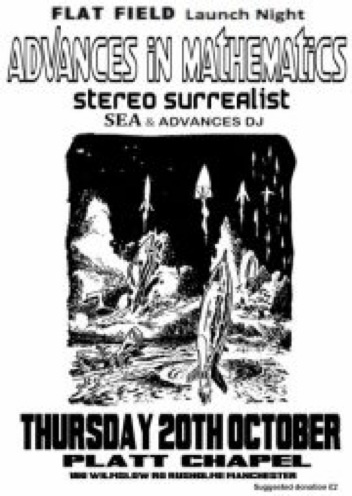 This occasion will present Manchester’s post-rock favourites Advances In Mathematics, experimental sounds from Chorlton’s Stereo Surrealist and soulful singer-songwriter Sea, who plays the rockingest drop-tuned acoustic guitar. Future Flat Fields will feature Gnod and Was Ist Das? Soundsystem, and on Thursday 8th December, Gabriel Minnikin and your very own Dead Sea Apes. Friday 28th October at the Ducie Bridge with Stalagmites, White Swallow and India Mill. We’re on at about 9:30. Free entry, cheap drinks. Promoted by Manchester Bands Union. Friday 25th November supporting Remember Remember (new album out on Mogwai’s label Rock Action!) – venue tba. Promoted by Fat Out Till You Pass Out. Thursday 8th December at Platt Chapel with Gabriel Minnikin.